What does it mean to be a sporty woman in the 21st century? From the launch of Net-A-Sporter, serving up sports clothing for fashionistas, to the introduction of #plankie as the new Instagram selfie for yoga bunnies; exercise for women has finally gone mainstream. But if sweating has never been so hot for female celebrities, then why are there still so many obstacles for girls and women when it comes to sport? Why do girls still hate school sports lessons? Why is sport consistently defined as male territory, with TV cameras replicating the male gaze as they search out the most beautiful women in the crowd? Will women ever flock to watch football, rugby and boxing in their millions? Or turn up to the park with friends for a Sunday morning kickabout? How long do we have to wait to see the first multi-millionaire female footballer or basketball player? 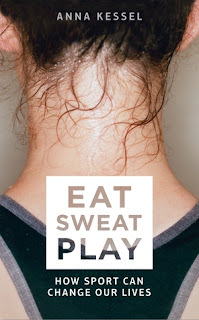 Eat Sweat Play is an engaging and inspirational work by sports writer Anna Kessel. I'm going to say this up front. I did not finish this book entirely as I felt it got a bit repetitive and I lost interest after a while. However I did think this book made a lot of sense and was thoughtful. The way it discusses women in sport, the role of the media and the various reasons why women are often put off from sport from a young age are thoughtful. The chapter about sports in school really rang true with me personally. This is a real feminist read and interesting whether you are actively sporty or not. It spends a far amount of time discussing how women are actively discouraged from a young age because sport and being sweaty are not seen as being feminine or attractive and actually questions why that is. It did enough to make me think about my own relationship with sport and I should be seeing it to get the most from it for myself rather than doing it because I feel obligated to do so. All in all if you enjoy feminist reads you'll love this regardless of whether or not you like sports and it might just inspire you to get more actively involved in a sport.